Eli and I met on match.com. I work in fashion design and Eli is an electrical contractor. Our first date was at Segovias restaurant in Little Ferry, NJ. Two years later, Eli took me to a fair in Overpeck County Park. After walking through the fair, we sat down on a bench and he proposed! He hired a photographer to capture our beautiful moment. When we got back to the car, I found a beautiful bouquet in the passenger seat that he had his friend place there while we were gone. Eli planned a surprise engagement party with our families afterward! We drove all through New Jersey looking for a waterfront wedding venue. It was 11pm, with no luck so far, by the time we reached Waterside. Luckily, Shantal Videla, our wedding coordinator, was available to show us the venue. We instantly fell in love with her and the stunning venue. Waterside was modern and fresh with phenomenal food. Shantal was personable, reliable, and understanding. Her professionalism and attention to detail made me feel at ease. 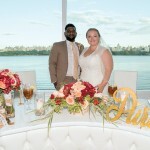 We were married outside with beautiful views of Manhattan behind us. Our officiant got to know us so he was able to personalize our ceremony with our own love story, hand-picked rituals, and fun jokes for our guests. Country music played throughout our cocktail hour. We still get compliments on that idea! We had various passed hors d’oeuvres such as pulled pork biscuits and artichoke beignets. Some of our favorite food stations were the carving station that served roasted pig with Caribbean salsa and NY pastrami with mustard and the seafood raw bar with shrimp, clams, oysters, and lobster tails! Our reception décor was clean and crisp all-white. We had alternating high and low centerpieces throughout the room. The high centerpieces were glass vases of hydrangeas, roses, and calla lilies. The low centerpieces were in three vases with orchids surrounded by floating candles. Our DJ provided incredible music, a photo booth, CO2 machines, a Frank Sinatra tribute singer, and the big hit of the night, an eight-foot tall robot that danced with our guests to house music! Everyone was on their feet all night. For the first course for dinner, guests enjoyed a vegetarian salad with champagne vinaigrette. For the main course, guests had a choice of chicken francese in a lemon butter sauce, dijon herb-crusted Atlantic salmon, or chateaubriand with a bordelaise sauce. For dessert, we had our delicious wedding cake along with an assortment of pastries and cookies. Everything was delicious! 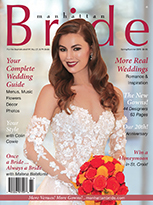 Thank you to all our vendors who made this wedding incredible, especially our bridal party dress designer for making everyone feel comfortable and beautiful, and our photographer Sam for your unique wonderful photos. Thank you to Shantal and Waterside for helping us create the perfect wedding. Most of all, thank you to our family and friends for a lifetime of wonderful memories.